← Good weather makes range time that much better. Sometimes measurements confirm what we expect. For example, S&B 115 grain ball flies at 1060fps from an HK P7PSP but speeds up to 1340fps from JRC carbine. But I had no idea that 1980s vintage .22 Short fired from the tiny Hi-Standard derringer would exit at 1280fps! That’s a 29-grain load shot from a 2″ barrel and somehow keeping up with 22LR. I like having a chronograph. My friend Don didn’t like what he found out with it. A nominal 3000fps .270 load came in at 2940fps — a small difference but short of the magic number. He’s going to see if crimping the bullet would make a difference and try again. I shot the JRC in left-hand configuration. I wanted to see how a left-handed user felt using a conventional carbine. Had to be careful prone as the empties sometimes bounced off the mat onto my left arm, but it was usable. The carbine ran through the 20 rounds I shot reliably. The main surprise was the accuracy: at 50 yards, it consistently printed 1.2″ groups with S&B ball. That load is cheap range fodder, so the result was fairly impressive. The optic used was the 3x Primary Arms prismatic. I think this covers the main calling of pistol caliber carbines: much better accuracy. 20-25% increase in muzzle velocity is not that important, but the drastic reduction in bullet dispersion is. Relative to rifle caliber carbines, 9mm is cheaper to shoot, less noisy and is allowed at more indoor ranges. Also shot Henry .22 with 1-4x scope and that was fun. My mount put the scope too far back and a little high for prone or kneeling positions but just right for standing. With the scope at 1x, the rifle made for a very rapid pop can perforator at 10 yards. At 4x, it enabled the same trick, though slower, at 50. Illuminated reticle really helped as the targets went into the shade. I will have to re-mount it further forward for comfort and perhaps add a slight cheekpiece, as the scope can’t be lowered much without interfering with the hammer on the rifle. Also need to find a way to add slings swivels. Suggestions are welcome. Savage mkII-SR was the usual joy, giving roughly 2/3″ clusters at 50 yards. Need a cheekpiece on this one also. I found out that the 4-16x scope has to be carefully adjusted for parallax and that I could not tell the correct setting by focus but rather by moving my eye until the reticle movement went away. Mostly, I shot it at 8x and used 16x for spotting. 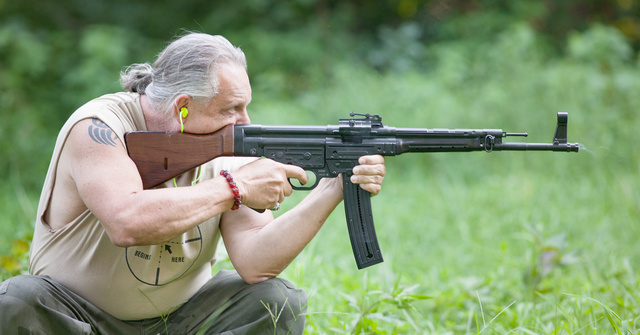 The rimfire STG44 was an interesting beast. It duplicated the centerfire original very closely. Keep in mind that mine is one of the prototypes with about 60,000 rounds on it, and the production version will differ in some details. Reliable and robust, looks and feels like the 1944 original. Comfortable to hold, points very well. Good balance, not front heavy. At 25 yards, shoots 4-5″ low with sights at on “100”. That’s more than the sight offset over bore. Rear sight had to be raised to “500” mark to get on target at 25. I expect that has been fixed in the production version. The verdict: it’s fun and it was the most shot carbine of the day. We probably put 300 rounds through it and the only malfunctions was the one I induced by interfering with the follower button (not rececssed) on the magazine, and one misfire with bulk ammo. An odd feature: safety lever seems backwards from what was expected, up for fire, down for safe. I will shoot it for accuracy today. My Walther P22 came back from repair with a new slide and some replaced internals. It’s back to being accurate with a suppressor, doing about 1″ groups at seven yards. The slide doesn’t lock back at all though, so I will have to find out about that. This entry was posted in advice requested, ammunition, pistol, rifle, sound suppressor and tagged chronograph, range. Bookmark the permalink. That STG44 looks pretty hot. Not really hot on a $600 msrp exactly. Does the entire reticule on the primary arms 3x prismatic illuminate or just the outside ring? Anybody tried it? The whole reticle lights up bright enough for daylight use. Would you come to the Gun Blogger Rendezvous VI and bring your marvelous toys? Please? Especially the STG44? Don’t think I can, scheduling conflict. Why don’t you venture to TN instead? Actually, that’s supposed to be Gun Blogger Rendezvous VII. Six was last year. I did last year. I attended the Luckygunner.com machine-gun shoot. I met you at SayUncle’s home. I’ve been to all six of the Rendezvous, though, and I plan to keep that attendance perfect.